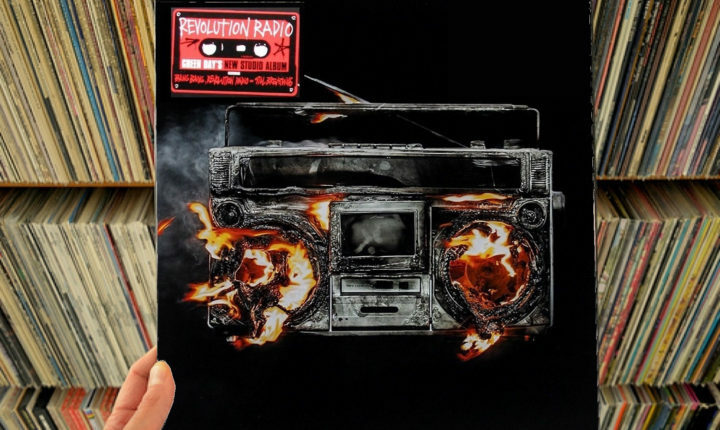 A deeper look at the grooves pressed into the Revolution Radio LP by Green Day. Some smart aleck is going to say that this review is a bit late in coming (yes, Revolution Radio was released fourteen months ago) but that’s part of the point here; Green Day’s twelfth album was touted as a much-needed return to the band’s roots after almost a decade spent releasing concept albums and enormous album trilogies (plus a fourth CD/DVD conglomerate for good measure). Revolution Radio saw Green Day attempt to rediscover the joys of a four-minute pop-punk song without any conceptual strings attached – you know, like they’d done on Kerplunk and Dookie – and it did work, but it came about twenty-two years after the band had broken through using that paradigm and one had to wonder if the world hadn’t changed, thereby robbing both the group and the album of the kind of staying power and lasting appeal that Green Day’s early albums have enjoyed. Said simply, attention spans have grown much shorter in the twenty-first century and the question has become whether or not the Revolution (Radio, that is) may still have any sway over audiences now that the initial fervor of the release has subsided. Such a question as the above looms large as Billie Joe Armstrong’s acoustic guitar plays gently at the opening of “Somewhere Now,” the opening cut on the A-side of Revolution Radio. There, the gentility of the guitar phrasing and lines like “I’m running late to somewhere now/ I don’t want to be/ Where the future the future and promises/ Ain’t what it used to be,” and listeners can really feel the sense of diminished expectation in the singer’s voice. He doesn’t exactly sound disappointed, but he’s running awfully close to that pole and, as Armstrong continues and sentiments of not wanting to compromise or sell out appear in a manner which basically states that both have occurred, it’s hard not to succumb to a little bit of the cathartic sense about them. …That is, until Armstrong chastises himself for playing it all too easy as he utters the words, “How did life on the wild side/ Ever get so dull?” and the song’s volume leaps from one to eleven in one enormous step. After that, the demeanor of the song changes completely as Billie Joe contrasts the shockingly safe and sterile nature of twenty-first century living (see the complaints like “All grown up and medicated/ I’m high on cellular waves”) with playing some very self-critical cards (“I put the riot in patriot/ And we all die in threes”) and arrives at a very well-balanced social critique which retains a lot of credibility because he doesn’t try to hold himself or his bandmates outside it. In effect, the singer implies that no one is going to be safe here. After the initial blast of “Somewhere Now” subsides, they just keep coming as Revolution Radio’s A-side continues. “Bang Bang” rips through a ferocious, sociologically aware rocker (check out lines like “Daddy’s little psycho and mommy’s little soldier” especially when they’re stacked next to imagery of marching to one’s own “private” drummer) before Armstrong models the melody in the album’s title track close to something from Dookie and then takes “Say Goodbye” on a march which is positively infectious before finding a way to connect it all to the ritalin-dosed child that Green Day knew so well early in their career and drawing the parallels to the thirty-something survivor found in “Bouncing Off The Walls,” which closes the side. In the latter track’s case, Green Day really does prove that they’re still the kings of the modern “pop punk” dynasty that they seized in 1994 and are still able to not only pen and perform a song like that in 2016, they can make it sound as good as ever. Here, Armstrong shows no age as he belts out lines like, “Caught burning gasoline, sleeping in reverse/ And everybody’s bouncing off the walls” and just blazes through a chord progression and arrangement which could have been pulled from any time in Green Day’s 31-year career; it’s perfectly timeless and ageless document which proves that, while the band may have turned high-concept over the last decade, they haven’t journeyed so far that they don’t know where home is or how to get back there – if they’re feeling it. After the spectacular conclusion that the A-side of Revolution Radio reaches with “Bouncing Off The Walls,” Green Day thinks better of trying to continue the thread and starts fresh on the B- with “Still Breathing.” Even on first listen (although with the song having been a blockbuster single now for over a year, the chances that any reader hasn’t heard it more than once are pretty remote), “Still Breathing” drips “greatness” and “classicism” within the context of those terms for the band. The unabashed power and crunchy drive of the song effortlessly overpower everyone who hears it and make instant fans of them all as the band also dangles and drops earworms into the craniums of all those with whom the song comes into contact. That can also be said of “Youngblood” and “Forever Now” – the other two undeniable hits on Revolution Radio‘s B-side – and while the acoustic closer “Ordinary World” leaves a little to be desired in a final missive (fans are no strangers to Green Day’s acoustic turns – “Time Of Your Life” was great, as was “Warning” – but “Ordinary World” just feels subdued or slow), the higher moments found throughout this running ensure that no listener will just stop satiated when “Ordinary World” shows them the proverbial door. There is absolutely, positively more than enough to be found on Revolution Radio to keep listeners coming back. ?Revolution Radio is out now. Buy it here on Amazon.